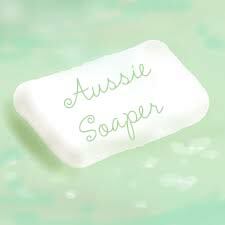 I have been making a new range of 100% natural goat's milk soap. I have posted a couple of pics on my facebook fan page but for most of them I am waiting until it dries out a bit and the colour comes out a bit more. This one looked so good as a log though so I took a photo of it! It is Spicy Orange and has sweet orange essential oil and coloured with red clay, cayenne pepper and cinnamon. It smells soooooo good! Thank you! It smells a bit like a cake...mmm... I just have to wait a few weeks until the colour inside develops a bit better like the top has. Can't wait! that looks great! can't wait to see the inside once it's cut. Thanks Lynn. Hope it turns out well. The pressure is on lol!! It looks like a wonderful abstract work of art - lovely! I couldn't wait four weeks so I had a peak! Thanks for all of your compliments! no wonder you couldn't wait! it's gorgeous! so you've done that by globbing (for want of a nicer word!) the different coloured portions into the mould? It's a lovely effect.